Baccarat (; French: ) is a card game played at casinos. There are three popular variants of the game: punto banco (or "North American baccarat"), baccarat chemin de fer (or "chemmy"), and baccarat banque (or "à deux tableaux"). Punto banco is strictly a game of chance, with no skill or strategy involved; each player's moves are forced by the cards the player is dealt. In baccarat chemin de fer and baccarat banque, by contrast, both players can make choices, which allows skill to play a part. Despite this, the winning odds are in favour of the bank, with a house edge no lower than around 1 percent. In Baccarat, cards have a point value: cards 2-9 are worth face value (in points); 10s, Js, Qs and Ks have no point value (i.e. are worth zero); Aces are worth 1 point; Jokers are not used. Hands are valued according to the rightmost digit of the sum of their constituent cards: for example, a hand consisting of 2 and 3 is worth 5, but a hand consisting of 6 and 7 is worth 3 (i.e. the 3 being the rightmost digit in the combined points total: 13). The highest possible hand value in baccarat is 9. The overwhelming majority of casino baccarat games in the United States, United Kingdom, Canada, Australia, Sweden, Finland, and Macau are "Punto banco" baccarat and they may be seen labelled simply as "Baccarat". 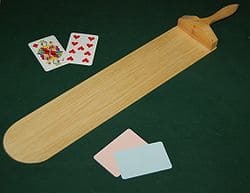 In Punto banco, the casino banks the game at all times, and commits to playing out both hands according to fixed drawing rules, known as the "tableau" (French: "board"), in contrast to more historic baccarat games where each hand is associated with an individual who makes drawing choices. Player ("Punto") and Banker ("banco") are simply designations for the two hands dealt out in each coup, two outcomes which the bettor can back; Player has no particular association with the gambler, nor Banker with the house. Punto banco is dealt from a shoe containing 4, 6, or 8 decks of cards shuffled together. A cut-card - a coloured (often yellow) piece of plastic, the same size as a regular card, and which is used in shuffling - is placed in front of the seventh-last card, and the drawing of the cut-card indicates the last coup of the shoe. For each coup, two cards are dealt face up (or equivalent) to each hand, starting from "player" and alternating between the hands. The croupier may call the total (e.g. "Five Player, three Banker"). If either Player or Banker or both achieve a total of 8 or 9 at this stage, the coup is finished and the result is announced: Player win, a Banker win, or tie. If neither hand has eight or nine, the drawing rules are applied to determine whether Player should receive a third card. Then, based on the value of any card drawn to the player, the drawing rules are applied to determine whether the Banker should receive a third card. The coup is then finished, the outcome is announced, and winning bets are paid out. If neither the Player nor Banker is dealt a total of 8 or 9 in the first two cards (known as a "natural"), the tableau is consulted, first for Player's rule, then Banker's. If Player has an initial total of 0-5, he draws a third card. If Player has an initial total of 6 or 7, he stands. If Player stood pat (i.e., has only two cards), the banker regards only his own hand and acts according to the same rule as Player. That means Banker draws a third card with hands 0-5 and stands with 6 or 7. If Player drew a 2 or 3, Banker draws with 0-4 and stands with 5-7. If Player drew an 8, Banker draws with 0-2 and stands with 3-7. If Player drew an ace, 9, 10, or face-card, the Banker draws with 0-3 and stands with 4-7. The croupier will deal the cards according to the tableau and the croupier will announce the winning hand: either Player or Banker. Losing bets will be collected and the winning bets will be paid according to the rules of the house. Usually, even money or 1-1 will be paid on Player bets and 95% to Banker bets (even money with "5% commission to the house"). Should both Banker and Player have the same value at the end of the deal the croupier shall announce "égalité - tie bets win." All tie bets will be paid at 8 to 1 odds and all bets on Player or Banker remain in place and active for the next game (the customer may or may not be able to retract these bets depending on casino rules). In casinos in Las Vegas and Atlantic City, punto banco is usually played in special rooms separated from the main gaming floor, ostensibly to provide an extra measure of privacy and security because of the high stakes often involved. The game is frequented by very high rollers, who may wager tens or hundreds of thousands of dollars on a single hand. Minimum bets are relatively high, often starting at US$25 and going as high as $500. Posted maximum bets are often arranged to suit a player. When it comes to online casinos, usually high roller baccarat games are played in separate rooms. A player that wants to play high roller baccarat online can do so only with an invitation which is not easily acquired. Most of the time the invitations are given to players that spend lots of time playing baccarat for real money. In contrast, the tie bet has a high house edge of 14.4%. Most casinos in the United Kingdom pay the tie at 9-1, resulting in a more lenient house edge of around 4% for the tie bet. EZ Baccarat is a proprietary variation of baccarat and is preferred in many casinos around the world. The EZ Baccarat draw rules and outcomes are identical to those of classic baccarat, with the following exception: a winning Banker bet is paid even money (1-to-1, instead of the 19-to-20 of standard Baccarat) except when it wins with a three-card point total of seven, in which case it is a “push” or a “barred” hand. The house edge on a Banker bet under EZ Baccarat rules is 1.018%, which is just slightly lower than the house edge on the Banker bet in standard commission-based baccarat. The use of this EZ Baccarat "push rule" is equivalent to taking a 4.912% commission out of every winning Banker bet payout. The three-card seven-point winning Banker hand (called a "Dragon 7") occurs about twice per eight-deck shoe. In addition to the no-commission feature, EZ Baccarat has two additional side bets: the Dragon 7 and the Panda 8. The Dragon 7 is a one-coup bet that always loses except when the Banker bet wins with a three-card score of seven. The Dragon 7 pays 40-to-1 when won and has a house edge of 7.61%. The Panda 8 bet is a one-coup bet that always loses except when the Player bet wins with a three-card score of eight. The Panda 8 bet pays 25-to-1 when won and has a house edge of 10.18%. The addition of the Dragon 7 and Panda 8 side bets, along with the significant increase in the number of coups dealt per hour, results in increased casino hold percentages from EZ Baccarat play. Apart from the principal benefit of increased game speed, casinos prefer EZ Baccarat not only because it eliminates both errors in calculating commissions and disputes with customers over proper commission amounts, but also because EZ Baccarat is often much easier for the casino staff to operate and supervise than is classic baccarat. The banker deals four cards face down: two to himself and two held in common by the remaining players. The player with the highest individual wager (or first in play order if tied for highest wager) is selected to represent the group of non-banker players. The banker and player both look at their cards; if either has an eight or a nine, this is immediately announced and the hands are turned face-up and compared. If neither hand is an eight or nine, the player has a choice to accept or refuse a third card; if accepted, it is dealt face-up. Traditional practice - grounded in mathematics, similar to basic strategy in blackjack, but further enforced via social sanctions by the other individuals whose money is at stake - dictates that one always accept a card if one's hand totals between 0 and 4, inclusive, and always refuse a card if one's hand totals 6 or 7. After the player makes his decision, the banker in turn decides either to accept or to refuse another card. Once both the banker and the representative player have made their decision, the hands are turned face-up and compared. Baccarat chemin-de-fer is the favoured game of James Bond, the fictional secret agent created by Ian Fleming. Bond plays the game in numerous novels, most notably his 1953 debut, Casino Royale, in which the entire plot revolves around a game between Bond and SMERSH operative Le Chiffre; the unabridged version of the novel includes a primer to the game for readers who are unfamiliar with it. It is also featured in several filmed versions of the novels, including the 1954 television adaption Casino Royale (Climax! ), where Bond - referred to as "Jimmy" by several characters - bankrupts Le Chiffre in order to have him eliminated by his Soviet superiors; Dr. No, where Bond is first introduced playing the game in film; Thunderball; the 1967 version of Casino Royale, which is the most detailed treatment of a baccarat game in any Bond film; On Her Majesty's Secret Service; For Your Eyes Only; and GoldenEye.